For this installment of Parks and Recreation I will explore the lengths our government goes to keep it's employees safe. Each month we are required to attend a safety meeting. Now our department went 1.6 million hours without a loss time accident, so obviously we listen well at these meetings. Supposedly that is like a really good record. The record came to an end because some seasonal park worker decided to weed wack his foot. He obviously did not pay attention at the meetings. Because we have seen many limbs severed/smashed/broken/blown up, you name it. For several years the best part about the safety meetings was our safety coordinator. He was probably in his late 50's? Always wore a button down shirt that was unbuttoned one too many buttons. Which nicely showed off his gold chain. It almost became a game to see how long the meeting would go before he made a sexist remark. We became quite familiar with the reference to "all you office gals in your high heals". Now first off, half the people in our office are guys. And the gals that we do have rarely wear heals. More flip flops/tennis shoes than heals. The week that we were talking about chemicals he made sure that "you women when you are at home cleaning" knew to be careful there with chemicals too. He did make sure to then say "or you guys, I don't know the arrangement in your house". Well I'm pretty sure I know what it is in yours. Any time chemicals were discussed he did try to tie it to our office environment by making sure we knew that we were also surrounded by danger. And every time he would only come up with the same two examples, toner and white out. A: we don't use white out, we use those correction tape things. B: I will try to refrain from sniffy or licking the toner when I refill the copier. Ok, crisis averted. The next best thing about safety meetings was the videos. We watch a video almost every week and let me tell you, I think they stopped making safety videos in the 70's. Or at least the city hasn't purchased any since then. Except the one where they were talking about stretching out at work and they cut from the warehouse floor to the break room where everyone was in spandex and leotards with headbands. That one was obviously made in the 80's. Now the videos vary from one geared towards mailmen walking in the snow and falling all over the place, to a video of a guy that was in a pipe line explosion and described in great detail what it's like to be in a burn unit. I got a little light headed during that one. 98% of safety videos involve some sort of warehouse/industrial building type environment. Every month after the meetings we would make jokes about how glad we were to have learned how to properly lock out/tag out the heavy machinery that we work with on a daily basis. I think we have joked about it for years, but my boss decided that this was the year. For our annual safety breakfast where they give us the fascinating stats about our safety record, we would create our own safety video. And we would make sure to emphasis the real hazards that surround us daily. For your enjoyment, I am presenting the internet premier of the Parks and Recreation Department's own safety video. Now I realize that this will probably be most enjoyable to those of you that are Provo alum. And please forgive us, it is painfully clear that none of us are professionals. Painfully. And when you get to the Arts Center scene (about 3:26) don't feel bad if you fast forward about a minute. Sorry Arts. Enjoy. And for all our sakes, be safe. A friend at work sent me this clip today, and it made me a little emotional. I'm very lucky and work in an office where I feel appreciated every day. And it's only been a rare occasion that I have felt like the last clip. Even if I HATE anything that requires me to buy food or plan a party for other people. First, I know my dedicated and faithful fans are probably desperately awaiting my latest Parks and Rec installment. However, I am still having technical difficulties on the home computer front, so the delay will continue. Try to cope with the disappointment. In the meantime, this does relate to parks. I took Will to a park in Provo today on my lunch and came away with a few thoughts. There was a guy there with his kids that was probably about my age, and several pounds above 200. The problem was he was sporting some shiny black lycra pants. Now they weren't the skin tight, tapered leg lycra pants at least, for some reason at least from about knee down they were straight legged. But the top was tight. And it really doesn't matter if he had weighed 100 pounds, guys please don't hang out at the park in lycra. I'm not sure why these pants exist, but they definitely should not leave the comfort of your own home. Sort of like when I go swim suit shopping and see bikinis in my size. Now if you are comfortable with your body, good for you, but you should not be wearing a bikini if you shop in the plus size section. Sorry, I just don't approve. So back to mr tighty pants. One thing I noticed was that he wasn't wearing a wedding ring. Which doesn't necessarily mean he's not married, but my first thought was, is this what I have to look forward to in the 30+ dating field? Second issue, park etiquette. I have tried very hard to teach Will that when you are at the park you wait your turn in line. You don't climb up the slide, you go around and use the stairs. You don't throw wood chips on other kids, you know, basic manners. The problem is, I go to the park and feel like I am the only parent that has tried to do this. For the first time today I did actually see another mom tell her daughter that she needed to use the stairs and not climb up the slide. And I've been to the park a lot, and seriously, first time. Now I understand that climbing up the slide can be another fun use of the equipment. But if you are at a busy park area and lets say there is one slide suitable for the younger than five crowd. And yet there are three ten year olds just hanging out on the bottom of the slide, laying across the slide, blocking anyone else from using the slide, it gets annoying. So I'm not sure what approach I should take at the park. Do I become playground monitor and in a nice way tell the kids to get the hell off the slide? Are you risking getting yelled at by another parent by saying something to their kid? Cause lets face it, my experience with disrespectful kids is that a lot of them learned it from somewhere. Do I just let kids be kids and do what most parents seem to do and ignore what's going on? I feel bad when I see my kid waiting patiently for his turn and his reward is never getting a turn because bigger/meaner kids just push by. And how do you walk that line of wanting your kid to be able to stand up for himself, but not become a bully. And on the other hand, be willing to let someone go ahead of him, but not become a push over? Another issue that has come up at the park is seeing Will deal with the social anxiety that both his parents passed along to him. Sometimes he will just start running around chasing other kids just joining in their play even if they are ignoring him. And then other times he stands off to the side wanting to go play with a kid, but too shy to make the first move. My heart breaks for him because I feel anxiety just watching him learn how to be a social person, and I'm not the best example. He came up to me last week and asked if I would go see if the boy wanted to play with him. I was thinking yeah right, there is no way I'm going up to that kid, and it was a kid. Like four. I'm suggesting a class be added to kindergarten and preschool, playground manners. And if you fail the class you lose playground privileges. I will volunteer to be the first teacher. Or maybe it needs to be added to prenatal classes, lets start with the parents and make sure they have a good understanding of what some expectations are. Aboriginal and Torres Strait Islander viewers should exercise caution when watching this film as it may contain images and voices of deceased persons. My first thought was, What the hell? Then the more I thought about it, the more I am interested in learning about their culture and the meaning behind the warning. Did they film in sacred areas where they believe that they would be able to hear or see the deceased? Is it everywhere in Australia? Was it things they referenced in the movie? Gonna need to find out more about this. The other comment that both myself and my sister had during the second part of the movie was that I don't remember ever knowing that Australia was involved in WWII. Are we so focused on our own history in school that it never got brought up? Were there just other events surrounding WWII that were deemed more important, and not enough time to talk about everything that happened? I'm curious. It's seeing things like that, that make me want to go back to school. But not really because I don't want to take tests or do homework based on what someone else thinks is important for me to learn. Because obviously our school system didn't think it was important for me to learn about Australia's involvement in WWII. Maybe I just need to read more. That would help. Although I like the classroom environment when it includes discussion and insights that you otherwise wouldn't get just from reading a book by yourself. Maybe I need to start my own school for adults where you just get together and learn about what ever you want to learn about and take turns deciding what the subject matter would be. Or is that called a book club? Either way, sounds like work, so probably never gonna happen. Maybe someone else could get on that. And thank you Maiken for mastering the universal remote so that after four months I no longer have to see the time counter display thingy on screen every time I watch a movie. While buckling Will in his car seat after picking up pizza, I was making some weird sound just goofing off. Will: Mom, that's too much noise. It's embarrasson. Might as well start the trend now, cause there is no way to stop the inevitable. Unlike my little sister Keeley, most people don't get to experience having a reality show taped at their job. Let alone two jobs and two separate reality shows, seriously what are the odds? I will come back to that in a future post. The next best thing though to having a reality show taped at your job, is having a sitcom written about your job. On Wednesday I ventured over into Parks country. Little background. I work in the main office for the department, but we mostly handle the Recreation side of things. (I hate actually writing out Recreation instead of just Rec, but my boss told me that we all get a pay cut every time we just write Rec.) We have a pretty good relationship with the Parks side, but their offices are in another part of town, so we don't interact on a daily basis. However, whenever lots of man power is needed, they come to our rescue. So when we got an email forwarded saying that they needed all hands on deck I figured I would do my part to represent the Rec side (sorry Scott) . Luckily Shellianne volunteered to join me, and boy did we have a fun time in store. The email had said that they needed help picking up rocks on the golf course driving range. Sounds exciting huh. When Shelli and I stared walking out to the range, the first thing we noticed was that everyone else was wearing gloves. Hmmm...should have thought of that. But it's just rocks we are picking up and I don't really like wearing gloves for things like that so we should be ok. One of the Parks guys came over and offered us some latex gloves. Well, we will look like dorks wearing blue plastic gloves while everyone else is wearing work gloves, but I'll put them in my pocket. Little more background. 25 years ago they built the golf course partial on top of the old city dump. There were some areas, the driving range in particular, that had problems with the grass growing because there wasn't enough top soil over the land fill and the methane gas kills the grass. There is a big project which is now on hold that will completely remodel and move portions of the golf course to accommodate a new shopping center. Boring political crap, but they had started the driving range, so needed to finish it. Part of the project was to bring in more top soil and raise up the level of the ground so that the grass would grow better. It is already working, but from what I heard digging in that area to put in new water lines was a pretty miserable job. When they would break into the ground you could physically see the methane gas leaving the ground, and I heard the smell was almost unbearable. Here is a picture of them digging one of the pipe lines. Notice all the garbage in there? Yeah, 25 years doesn't really do much to garbage. So we line up across half of the range with a few mules and carts in front of us to throw the rocks in. We are going to walk up one side of the range, turn around and do the other side. So we start walking and they are yelling out, make sure you also pick up any garbage you see. 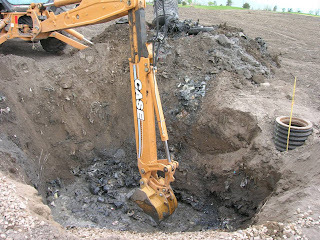 Even though I had heard them talk about the garbage in the ground, I guess I didn't really put it together that some of that stuff got dug up during the construction, and made it's way to the surface. Ok, time to put on the rubber gloves. It's kind of weird to see this brand new grass growing, and then random plastic bags growing up out of the ground also. Then we came to it. Tampon alley. Nicknamed that by the Parks crew because for some reason, in mostly one long strip, there is an overabundance of tampon applicators. I mean, one on the ground is really an overabundance, but this was ridiculous. Yeah there was lots of other random garbage, but it was all random. Plastic bag here, weird mesh strap here, piece of glass here, but nothing else had multiples except the tampon applicators. All pink plastic applicators. I picked up at least 20. Now how many people can say that about their jobs? Yes today I left the office for a break and spent an hour walking in the wind picking up rocks and tampon applicators. I know this is TMI, but it did make me very glad that I personally use a brand that doesn't have applicators. And it did make me also feel really guilty about all the other plastic that I do throw away. I really wish recycling was easier to do around here. It's kind of disheartening to look at something that was thrown away at least 25 years ago, and it looks like it could have been dropped there yesterday. My little bright spot of the day was when I went to pull up a piece of unknown plastic substance and out popped this piece of trash which had created a perfect little pot for grass, and one weed. Sweet huh. I decided that this little gem needed to become my newest desk accessory. Bring a little green into my space. It's my new office buddy, I just need to think of a good name for him. About an hour after our exciting turn in the Parks field, we went and provided a "rest stop" for about 60 employees from Provo City and NuSkin who were participating in a walk for national start walking day or some crap like that. We had a very exciting team building activity which 6 people participated in, and passed out a walking scavenger hunt for people to fill out on the way back. Shelli and I put our heart and soul into creating that scavenger hunt. And I don't care what you say Mr. NuSkin employee, there is only one house with a tree house along that stretch of road. Being able to see a tree house through the block on another street is not "on Center Street" is it? So that was just a glimpse of a few hours into the exciting world that is Parks and Recreation. I know, I know, sadly we currently are not hiring, but stay tuned, excitement is always just around the corner. To just say I love the rain doesn’t give my feelings justice. I feel an earthy, spiritual connection to rain. It replenishes my soul. 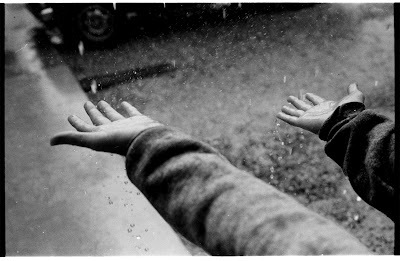 I’m not sure when my connection began, although I can’t remember a time that I didn’t love the rain. When I was younger I actually wished my name was Rain. Although Pat never shared my joy of the name, when we first thought I was having a girl I think I had him worn down enough to let me use it as a middle name for our daughter. It’s sad that was my biggest disappointment when the second ultra sound said I was having a boy, I didn’t get to name my little girl what I wanted. I know some people think of rainy days as gloomy, depressing, disappointing. I don’t share any of those feelings. Rainy days make me feel comforted, cozy, protected, calm, content. The smell of an impending storm is like a shot of endorphins. There is also a very strong romantic attachment to rain which I can probably blame on watching too many movies such as Sense and Sensibility and First Knight. It was taken during a rainstorm in Kanab of my sister Keeley. I really wish photography was a talent I possessed and Will has taken many that I admire. I instantly connected to this photo the first time I saw it and it has been my home computer's wallpaper ever since. I’m sure some people will look at it and not feel anything, that’s the thing about art it touches everyone in a different way. When I look at this picture it somehow encompasses everything I love about the rain. I wish it was a mural on my bedroom wall because if I woke up to it every morning it would be a perfect start to the day. One thing that I don’t like about my job is that it has made it so I do feel some regret when it rains March – October. The problem with rain during those months is that it negatively affects running outdoor sports. And you would not believe the reaction some parents have to being told that no, we are not canceling soccer because it is raining. So for that time of the year I would love for it to rain every Sunday, and leave the rest of the week clear. But that’s the only reason I would tell the rain to go away. Other wise, bring it on, and if there is some lighting and thunder thrown in, all the better for my enjoyment. Although even on those days of being yelled at or having my intelligence insulted, those feelings all wash away as I walk out to my car and feel those drops on my face. That's the thing about the rain, it just makes everything better. I realize as I write this post that it is probably along the lines of something that is only interesting to me, but hey, that's why I have a blog. On Wednesday I had my final post-op visit for a gum graft I had done about a month ago. They were showing me pictures of the progress and I said it was too bad they couldn't give me a copy of them because I would love to put them on my blog. 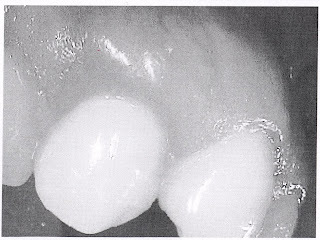 My dentist thought that was pretty cool but the best he could do was a black and white printout of them. Since he went to the trouble I have to take the time to document this interesting experience. About two years ago at my regular dentist checkup, when asked if there were any teeth that were bothering me, I said that I did have one that would go through phases of being really sensitive. 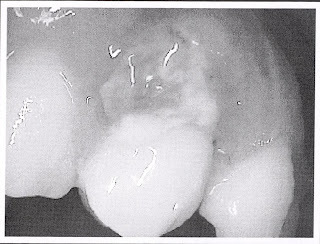 The dentist said that my gum was receding over that tooth and talked about the possibility to doing a gum graft. At that time I don't think I even asked any more questions. It wasn't something that gave me constant pain and not enough to go though what ever a gum graft was. 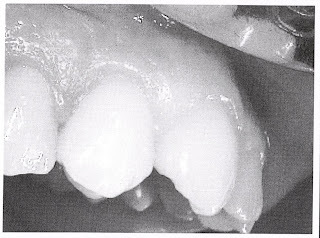 I am a faithful six-month check-up at the dentist, and every time he would ask me about the tooth. I just kept brushing it off and never thought much about it. At my last visit in January I gave it a little more thought. Mostly because since I'm not paying for Pat's medical bills anymore, I have a lot more insurance money to spend. So this time when the dentist brought it up, I asked him to explain more about it. For a gum graft they take a piece of tissue from the roof of your mouth. They then pull your gum away from the tooth and slide in the new piece of tissue. Like putting it in an envelope. The dentist said that the benefit of doing it now was that my gum was still healthy so I had a better chance of it working well. The problem with your gums receding is that it puts that tooth or teeth at greater risk for cavities. As the problem continues you put yourself at risk for damage to the roots and can lose the tooth. They sometimes do things like putting a filling over the area just to give it extra protection, but a gum graft has the greatest chance of restoring the tooth to normal. What the hell, lets do it. 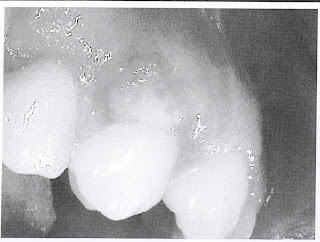 Here is a photo of my tooth before the procedure. Sorry about the lack of quality. I really wish I could have gotten good copies in color because I thought they were very interesting. Shocking I know. It's the second tooth from the left and I'm sure you are thinking, what's the problem? It's not as easy to tell in black and white, and even then not really obvious, but the gum goes higher on that tooth and had a part right at the top where the tooth was starting to be affected. There is a ridge of gum and then the gum really thins out above that which was something they were also concerned about. When the procedure was explained to me I thought they would just sort of slice off a piece of skin from the roof of my mouth. From what I could tell during the procedure, and looking at it afterwards, I think they cut open the roof and took a piece of tissue that was right along the bone. I had three stitches on the inside of my mouth and two on the actually graft. This is a week after the graft. This is the one I really wish you could see in color. It was gross. It looked like something had died on my tooth. And to make matters worse I wasn't allowed to brush my teeth in that area for three weeks. I had a medicated rinse I used so I'm sure everything was fine, but not being able to brush your teeth makes you a little paranoid that you are walking around with the worst breath in the world. And thanks to my boss I chew gum everyday after lunch which would have helped, but I couldn't chew gum until after the stitches came out. This is two weeks after the graft. Finally starting to look better. Still a little like something had died on my tooth, but I was finally seeing progress. My tongue had finally stopped playing with the hole left from the graft and the pain had almost completely gone away. At this is from my final visit. The gum is back down to a protective level and nice and plump above the tooth. The dentist said that when they pulled back the gum there was more damage to the bone underneath then was thought, which he said usually is the case. So it was a good thing I had the procedure done and it has healed very nicely. And I can brush my teeth there again! Never thought I would be excited about that. So after dealing with pain, wearing a retainer to protect the stitches on the inside of my mouth, feeling that something had died on my mouth and never would be the same, I made it out the other side. And now have a healthy new patch of gum to show for it. We just got back from BYU Young Company's production of Go Dog Go! It was held at the Covey Arts Center in Provo. I thought about taking Will since Go Dog Go! is one of his favorite books, but was a little hesitant about whether or not he would be interested in a play version. I have only taken Will once to the movies, Wall-E. And even though he loved the movie he still asked every 10 minutes to go home. He just didn't understand why we couldn't go home and watch the movie there. After talking to a few people that had gone to the Jungle Book production they did last year, I figured the discount tickets I could get from work would be worth the try. My mom, sister Maiken and her daughter Lucia went with us. I'm glad we did because Will loved it. He sat like this the whole time. When it was done the cast came out and you could go onstage and meet them and take photos. I was very shocked when Will said he wanted to go up and meet his favorite, the green dog (the only male cast member). When we got up on stage he wouldn't go anywhere near the green dog. I tried taking Will's picture with the green dog behind us, and of course a couple of other kids got in the shot right as I took it. The green dog saw what I was trying to do and started crawling behind Will to get in the picture without him knowing. And wouldn't you know it, just as I went to take the photo, Will walked out of the shot. Oh well, still a fun time. It's nice taking a kid to a play designed for kids so you don't have to worry as much about a kid being a kid during a play. Even though Will was very good, just sat staring with a slight grin on his face. It was funny to hear little kids yelling out "go do go" and other things from the book. Will was a little disappointed that there wasn't a ferris wheel or helicocker like in the book, and on the way home told me there wasn't a fire dog (dalmation) in the book like there was in the play. But I think a very sucessful first time theater experience.